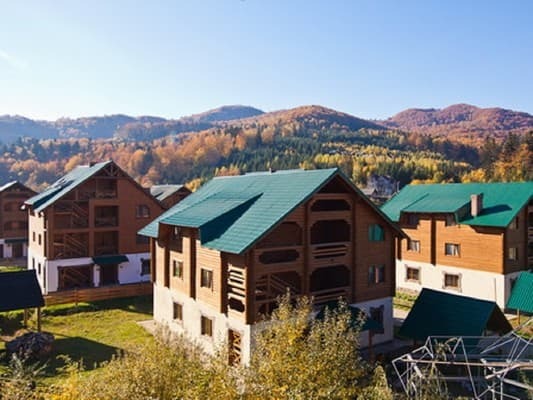 "Cottage town" Edelweiss "is located in the resort town of Migovo. The rooms of the hotel complex are fully equipped with everything necessary for a comfortable stay. 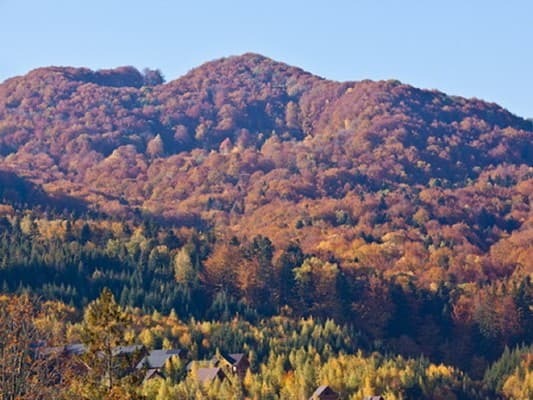 Attentive staff of the hotel "Cottage Town" Edelweiss "take care of the comfortable rest of each guest. On the territory of the complex there are 4 cottages - 50 rooms of the following categories: 5 apartments; 18 suites; 16 junior suites; 12 standards. 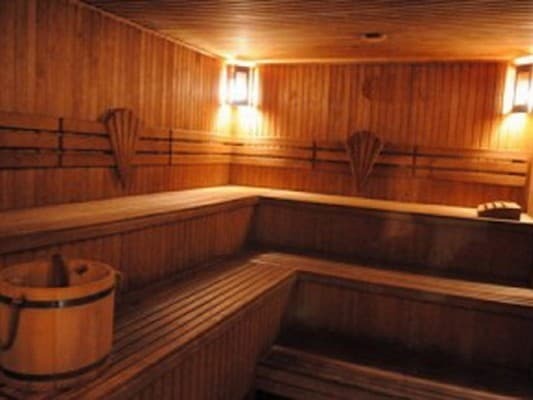 All cottages and furniture in them are built of natural wood. 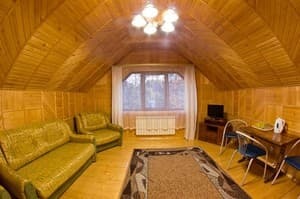 Описание номера: Room area of ​​16 sq.m with all amenities. Separate women's and men's rooms. Each room has: a bathroom. Three bunk beds, chained bedside tables, a wardrobe. Each room is designed for 6 people. 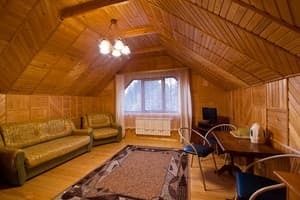 Описание номера: One-room 16 sq.m. with all amenities, two single beds, bedside tables, a wardrobe, a dining table with chairs. Description of the room: A spacious one-room suite with all amenities for 2 + (1) people (22 sq.m.). Two single beds, bedside tables, wardrobe, dining table with chairs. 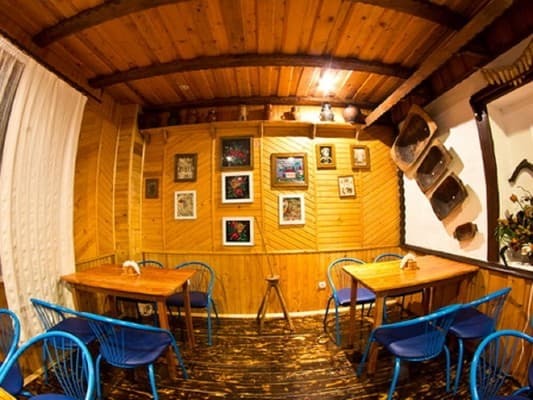 Описание номера: One-room 16 sq.m. with all amenities, three single beds, bedside tables, a wardrobe, a dining table with chairs. Описание номера: A spacious room with two adjoining rooms separated by an arch with all amenities for 2 + (2) people (35 sq.m). Soft folding sofa or armchair, double bed, bedside tables, coffee table, dining table with chairs, wardrobe. 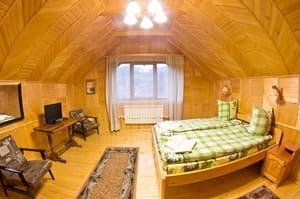 Описание номера: Comfortable room with two adjoining rooms separated by an arch with all amenities, for 2 + 3 people (34 sq.m). Soft folding sofa and soft folding armchair, double bed, bedside tables, chest of drawers, coffee table, dining table with chairs, wardrobe. Описание номера: Comfortable room with two adjoining rooms separated by an arch with all amenities and a hall, for 4 + (2) people (56 sq.m.). Soft folding sofa, two soft folding armchairs, a double bed, bedside tables, chest of drawers, toilet and coffee tables, dining table with chairs, wardrobe, dressing room. Привітний персонал. В номері чисто. Удобные кровати, в полулюксе: чайник, 2 стакана, 2 чашки, 2 ч. ложки, столик и 2 стула постельное белье меняют и делают влажную уборку мы отдыхали в июле, персонал и руководство замечательные, огромное спасибо за гостеприимство!!!! с нами были 2 собачки, за, что огромное спасибо Ире за то, что мы смогли отдыхать с животными!!! There is a restaurant on site. The farmstead is located 60 km from the town of Chernivtsi, 100 km. from the city of Ivano-Frankivsk. 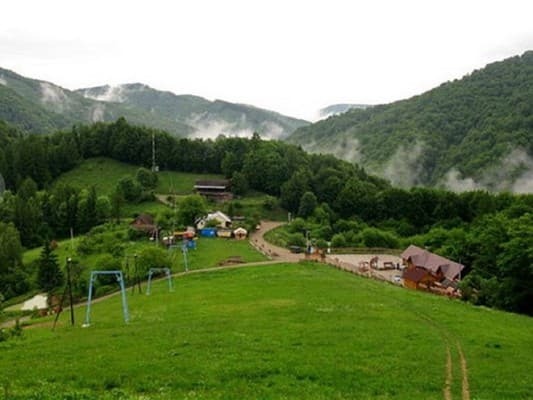 The nearest ski lift is just 15 meters away. From the central bus station in Chernivtsi daily scheduled shuttle buses "Chernivtsi" (AC-1) - "Migovo". Duration of the route is 1 hour. Buses call in on the territory of State Customs Committee "Migovo". If necessary, you can arrange a transfer for groups with comfortable buses.